Ever wonder how to find the best diaper for baby? I know I did when I found out I was pregnant with my first! Searching high and low for reviews, I found lots of info but moms were on every side of the spectrum. This mama thought this was the best diaper for baby, while the next mama hated it. How’s a mom supposed to know what will be the best diaper for her baby? My thoughts exactly. This article may contain affiliate links. All opinions are my own. See disclosure for more info. Everyone has different expectations when it comes to diapering their babies. Some moms have absorbency at the top of their priority list while others have comfort. Some mamas need a naturally-made diaper or need one for sensitive skin. As a first-time mom I know I was unsure if I had the best diaper for my little one. Certain diapers smelled too strong, I wondered about chemicals, this one gave my baby a rash…it was tough. The problem is…you don’t know what diaper will work best for you and your baby without buying and trying them all! Such a problem because you want your baby to be safe and comfortable. Finding the best diaper for baby is important. I mean, you are going to be doing this whole “diaper-thing” for the next three years or so and possibly for more than one munchkin!! Your baby goes through about 2500 diapers each year- this is a big decision! 😉 Since your baby may leak often or get rashes easily, you want to try diapers out without the cost of buying a package of every brand out there. Only to find that the huge pack you just bought, causes baby’s buns to be sore! RELATED: What’s In My Diaper Bag? Enjoy Let’s MAMA? Subscribe for mama tips and inspiration! Now You Can Find Best Diaper for Baby! Diaper Dabbler has over 20 brands of diapers to choose from so you can be sure to find the best diaper for baby. Finding a diaper that is comfortable for your little one, doesn’t cause a rash, doesn’t leak and absorbs well has never been easier. You can choose from diapers that are eco-friendly, store or name brand and find the best diaper for your little one. 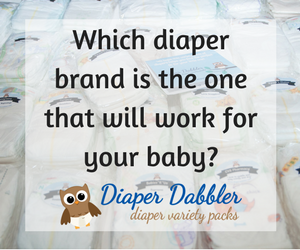 Diaper Dabbler Makes it EASY to pick the brands you’d like to try or you can choose from their pre-made packages. They have several diaper brands to choose from including brands like Pampers, Target, and Huggies! This Megapack has 24 different brands of diapers to try including store brands, name brands, and eco-friendly. This is the best way to find the best diaper for baby. Find the diaper that fits just right, soaks up well, and is comfy and safe for your little one. Whether you are expecting your first baby or a seasoned pro, this may be just what you are looking for! I wish I had known about this sooner. Grab yourself a sample package before you waste money on diapers that may not work for your baby. This is also the PERFECT gift for any expecting mama. If you are looking for a unique gift for an expecting mama in your life, why not give her the gift of the perfect diaper brand for her baby? Diaper Dabbler will even gift wrap it for you! Baby shower? Christmas? Home from the Hospital gift? This is just perfect. There is a diaper for every baby. Ooo, and they even have a toddler pack too! Also (side note), this is my all time favorite diaper bag. I’d love to hear if you think these are a good idea? Did they work for you? Which diaper works best for your little one? ?